Immune checkpoint pathway is a focal point of today’s cancer research. PD-1 is one of the best characterized checkpoint proteins. The binding between PD-1 and its ligand PD-L1 and/or PD-L2 suppresses T-cell activation, and allows cancer cells to escape from body’s immune surveillance. This mechanism prompts the idea that neutralizing PD-1 pathway may help re-engage the immune system to fight against cancer. In recent years, multiple lines of anti-PD-1 drugs have been developed, and have demonstrated enormous potential in recent clinical trials. Patients with melanoma, renal cell carcinoma, non-small cell lung cancer (NSCLC), or hematological cancers all respond positively to this treatment. ACROBiosystems provides a comprehensive series of PD-1 related products for researchers to investigate and target PD-1 pathway. ELISA is an assay technique routinely used to characterize protein-protein interaction. It’s often used in initial high-throughput screening (HTS) of compound library. ACROBiosystems has developed a range of pre-biotinylated PD-1 pathway proteins. Biotinylated proteins can serve as two-way antibodies for both capture and detection in ELISA assays. They demonstrate higher specificity and detection sensitivity than traditional antibodies. Fig. 1 Immobilized human PD-1 (Cat. No. 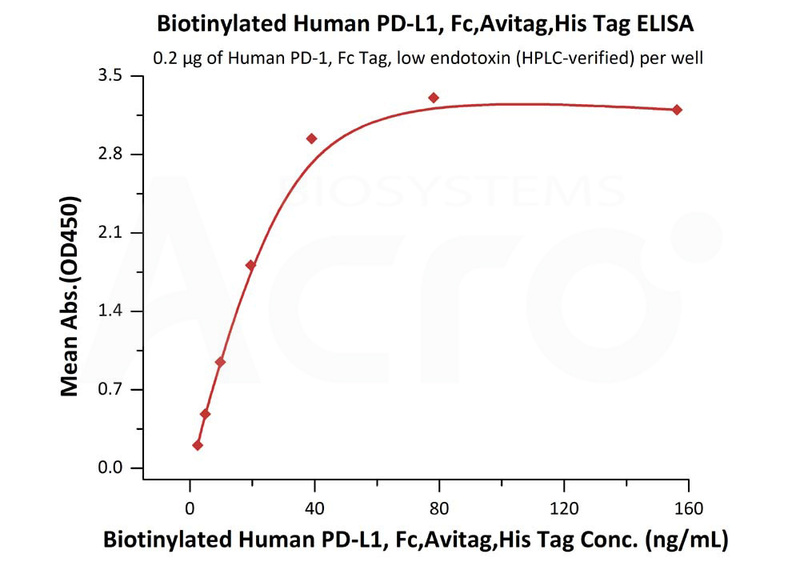 PD1-H5257) at 2 μg/mL (100 μL/well) can bind to biotinylated human PD-L1, His & Fc tag (Cat. No. PD1-H82F3) with a linear range of 0.01-0.25 μg/ml. To further simplify your research, we’ve developed a PD-1[Biotin]: PD-L1 Inhibitor Screening Kit (Cat. No. EP-101). 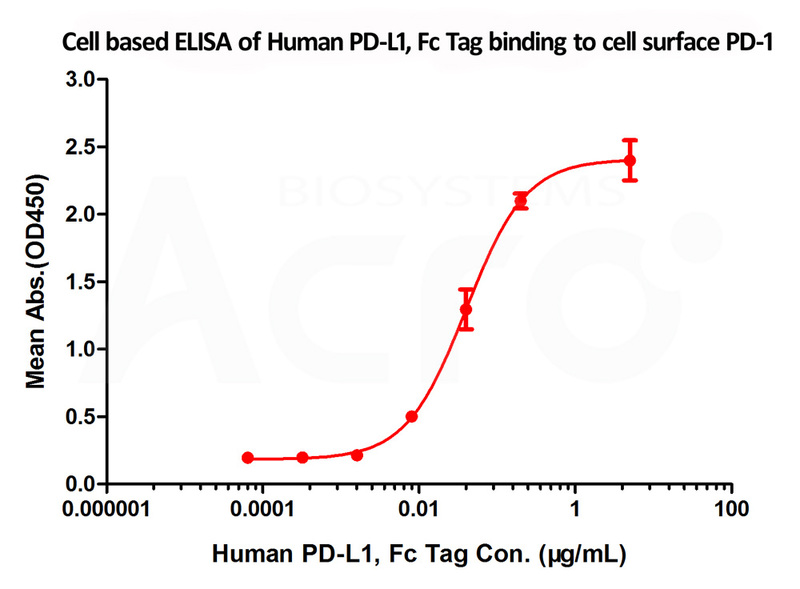 This assay employs a simple colorimetric ELISA platform, which measures the binding between immobilized human PD-L1 and in-house developed biotinylated PD-1 protein. This product is uniquely suitable for rapid and high-throughput screening of putative PD-1 and PD-L1 inhibitors. Fig. 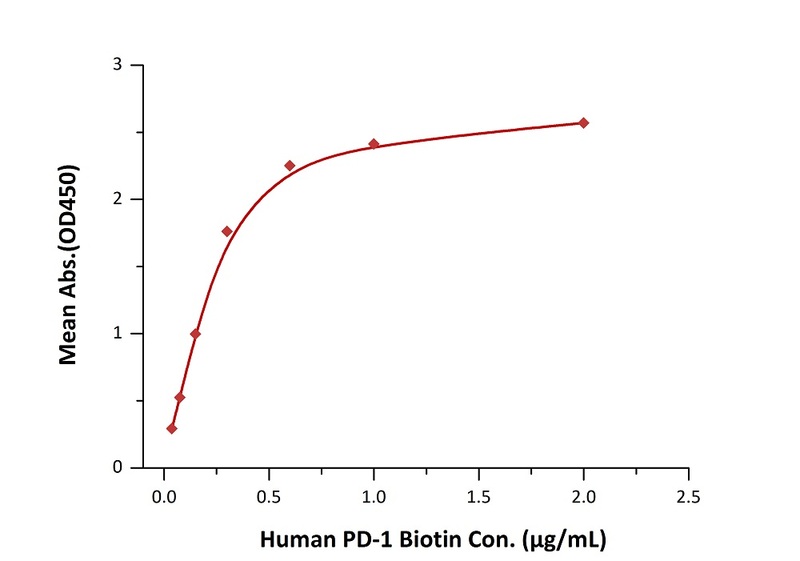 2 Immobilized PD-L1 at 2 μg/mL (100 μL/well) can bind biotinylated human PD-1 with a linear range of 0.038 - 0.6 μg/mL when detected by Streptavidin-HRP. Fig. 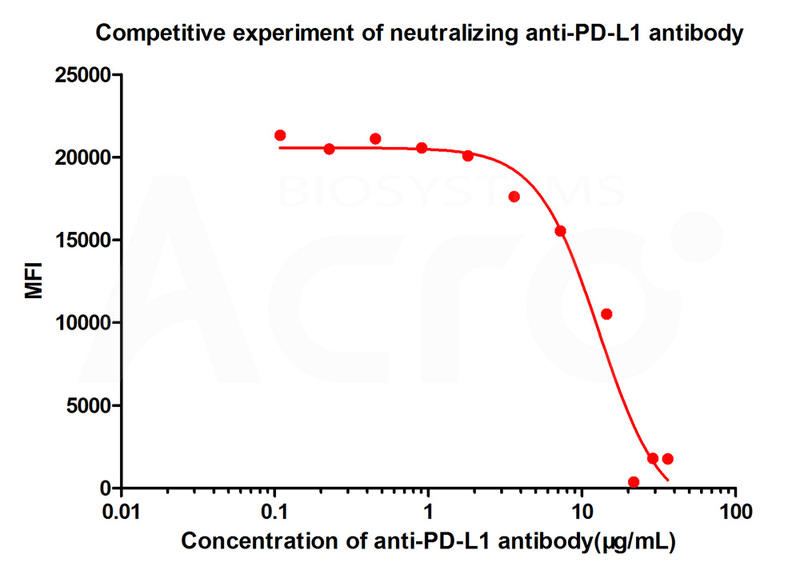 3 Inhibition of PD-1-PD-L1 binding by an anti-PD-1 neutralizing antibody is measured by the PD-1 [Biotinylated] : PD-L1 Inhibitor Screening ELISA Assay Pair (Cat. No. EP-101). Biotinylated proteins can be used along with fluorophore-tagged SA to detect/isolate cells expressing particular surface markers. In a US patent titled "ANTI-PD-1 ANTIBODIES AND METHODS OF USE THEREOF" (US patent 20160159905), the authors (from Pfizer Inc.) used ACROBiosystems' biotinylated PD-L1 (Cat. No. PD1-H82F3) and biotinylated PD-L2 (Cat. No. PD2-H82F6) to compete with candidate antibodies in a binding assay against PD-1 expressing cells. 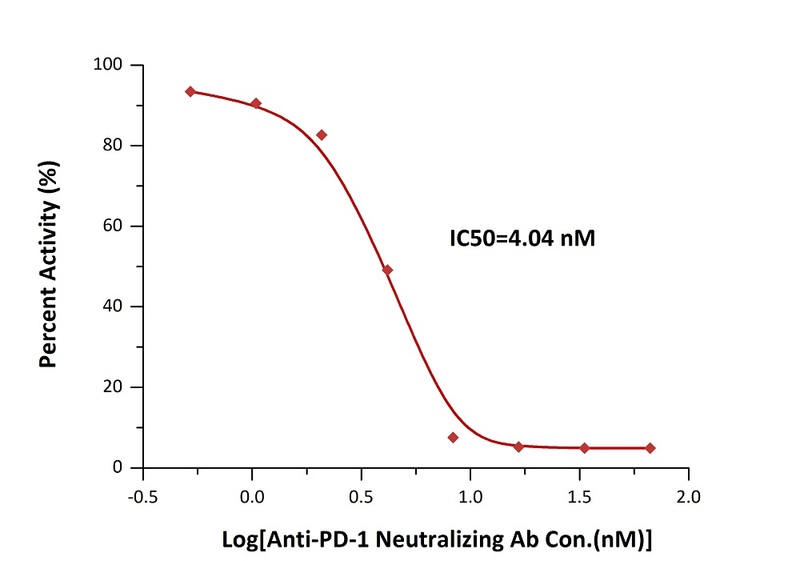 This assay provides measurement for the binding activity of the corresponding antibodies. Biopanning has gradually become the mainstream approach for antibody development. The AviTagTM biotinylated proteins can be used with SA-coated magnetic beads/surface in biopanning. It’s a much better choice than non-biotinylated, or chemically biotinylated proteins because it offers higher coating density and uniformed antigen presentation. Please note that the Fc tag is generally undesired for these experiments because it generates false positive results. We have developed AviTagTM PD-1 pathway proteins with only His tag attached. These products are recommended specifically for biopanning. As a professional supplier of pharmaceutical companies, we have established a cell based assay platform to verify the activity of the target protein, which provide cell based experiment data support for drug screening. ACROBiosystems used human PD-1 overexpressed 293 cells made in-house in flow cytometry assay and cell based ELISA, and the results showed good performance of PD-L1 (Cat. No. PD1-H5258) and PD-L2 (Cat. No. PD2-H5251) binding to PD-1. Fig. 5 Flow Cytometry assay shows that recombinant human PD-L2 (Cat. No. PD2-H5251) can bind to 293 cell overexpressing human PD-1. The concentration of PD-L2 used is 1ug/mL. Fig. 6 FACS analysis shows that the binding of PD-L1 (Cat. No. PD1-H5258) to 293 overexpressing PD-1 was inhibited by increasing concentration of neutralizing anti-hPD-L1 antibody. The concentration of PD-L1 used is 10 μg/mL. The IC50 is 12.92 μg/mL. Fig. 7 Immobilized cell surface PD-1 (5x104 of cells per well) can bind Human PD-L1, Fc Tag (Cat. No. PD1-H5258) with an EC50 of 0.029 μg/mL. Fig. 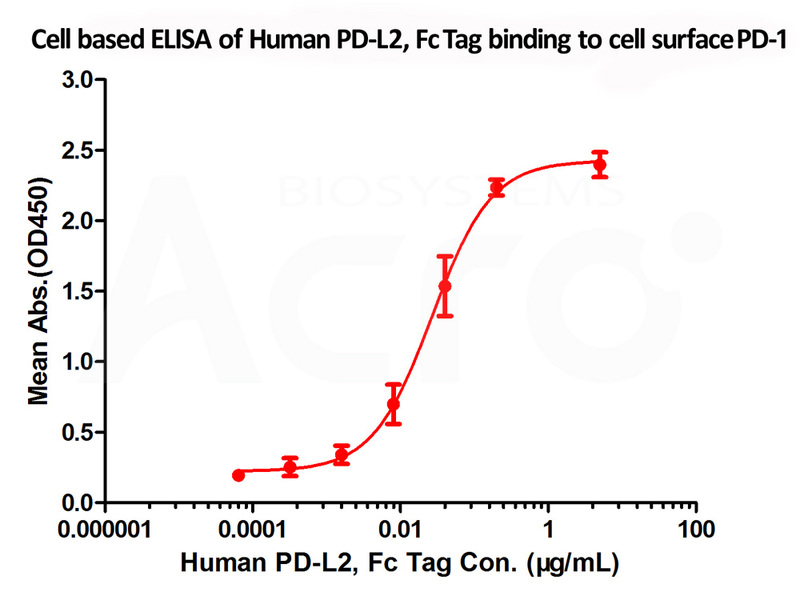 8 Immobilized cell surface PD-1 (5x104 of cells per well) can bind Human PD-L2, Fc Tag (Cat. No. PD2-H5251) with an EC50 of 0.018 μg/mL. Authors: Li Y, et al. Authors: L Wu, et al. Authors: J Li, et al. 4. A novel PD-L1-targeting antagonistic DNA aptamer with antitumor effects. Authors: Lai WY, et al. Authors: Yasmina Noubia Abdiche, et al. Ishida Y., et al., 1992, EMBO J. 11 (11): 3887–95. Blank C., et al., 2007, Cancer Immunol. Immunother. 56 (5): 739–45. Agata Y., et al., 1996, Int. Immunol. 8 (5): 765–72. Freeman GJ., et al., 2000, J. Exp. Med. 192 (7): 1027–34. Latchman Y., et al., 2001, Nat. Immunol. 2 (3): 261–8. Yamazaki T., et al., 2002, J. Immunol. 169 (10): 5538–45. Dong H., et al., 1999, Nat. Med. 5:1365-1369. Freeman G.J., et al., 2000, J. Exp. Med. 192:1027-1034. Nishimura H., et al., 2001, Trends in Immunology 22:265. Tseng S.-Y., et al., 2001, J. Exp. Med. 193:839-846. Latchman Y., et al., 2001, Nat. Immunol. 2:261-268. He X.-H., et al., 2004, Acta Biochim. Biophys. Sin. 36:284-289.